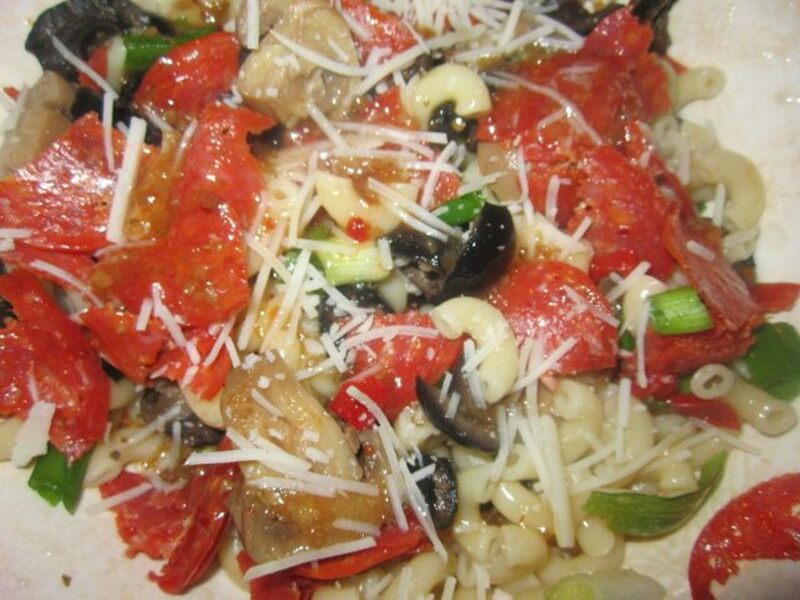 Italian Pasta Salad Recipe - Yummy! We love pasta salads! I think they’re a great dish to throw together for a picnic, a barbecue, or a cookout. 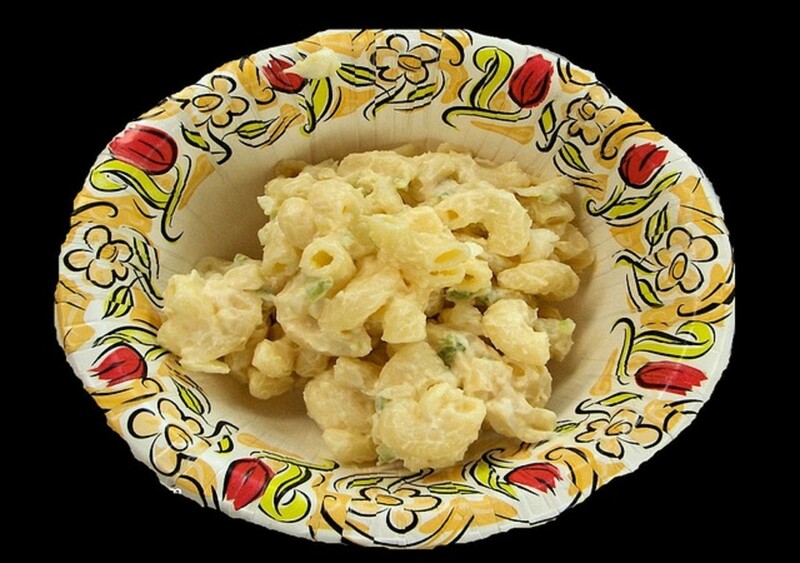 Pasta Salad is a nice change from potato salad, which is another one of our favorite side dishes for the occasions I mentioned. I don’t always have potatoes on hand. Spuds don’t keep forever before going bad, but dried pasta, on the other hand, has a very long shelf life. I practically always have a box or two in the pantry, so I can make a side salad almost any time. 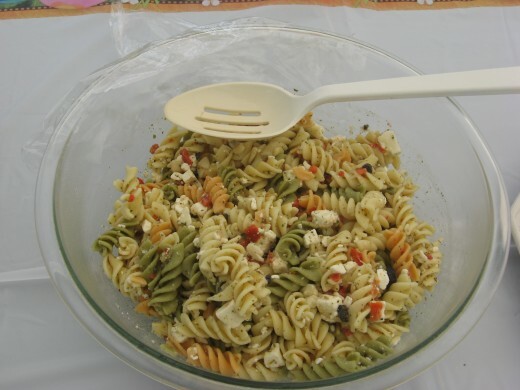 Today, I’m sharing with you my original recipe for Italian pasta salad. It was a big hit at our last cookout! The creamy salad was wonderful with the spicy BBQ pork we served. To make the dish even heartier, you might want to add salami or diced ham. You might also want to include some shredded cheese, like mozzarella, for example. 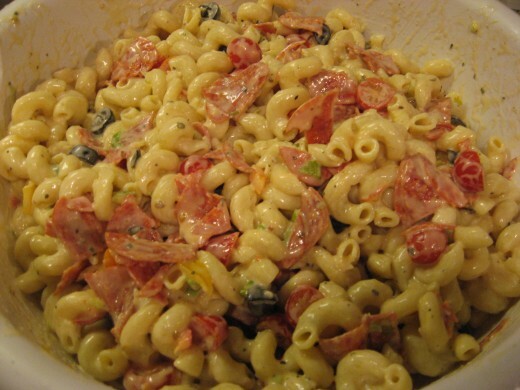 Pasta salad is easy to make! First, choose the type of pasta you want to use. For salad, I usually prefer elbow macaroni, Rotini, penne, bowtie, or Cellentani. 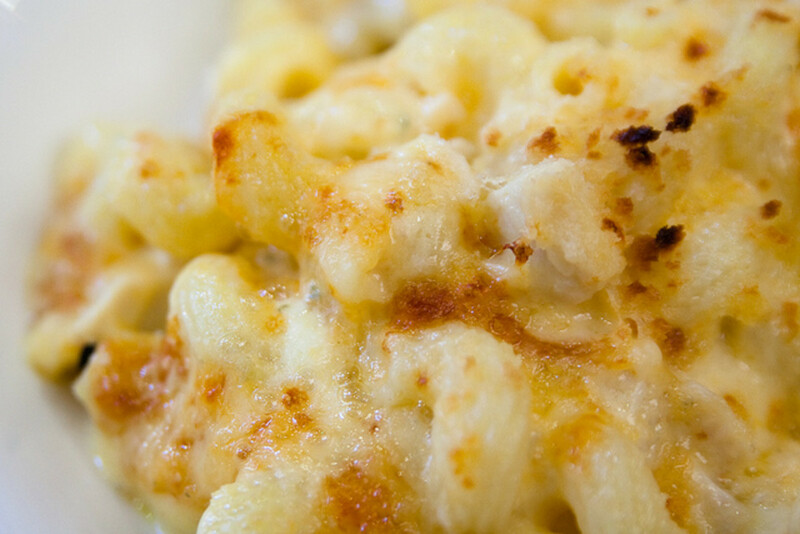 The hollow tubes and the nooks and crannies of these pasta shapes hold onto a lot of the dressing. Of course, you might prefer using a different type of pasta. You’ll need to cook the pasta to your desired texture. Don’t get it too soft, however. When the pasta has been cooked in boiling salt water with a tiny bit of oil, pour it into a colander and run cold water over it. Do this until the pasta is at room temperature. Next, I usually chill the pasta in the fridge, covered, for a few minutes. When I’m ready to make the pasta salad, I separate the individual noodles with my hands in a large bowl. I add the other ingredients I want to use, and then I toss everything with a dressing. What type of dressing to use is up to you. Most cooks create a dressing from a mixture of oil, vinegar, mayonnaise, sour cream, bottled salad dressings, sugar, herbs, and/or spices. I once had a pasta salad with a honey-mustard dressing, and it was very good. The playing field is wide open when it comes to pasta salad ingredients! some common additions include pickles, diced onion, scallions, diced or chopped celery, bell pepper, pimientos, jalapenos, sweet pickled peppers, green olives, black olives, cherry or grape tomatoes, fresh broccoli florets, etc. 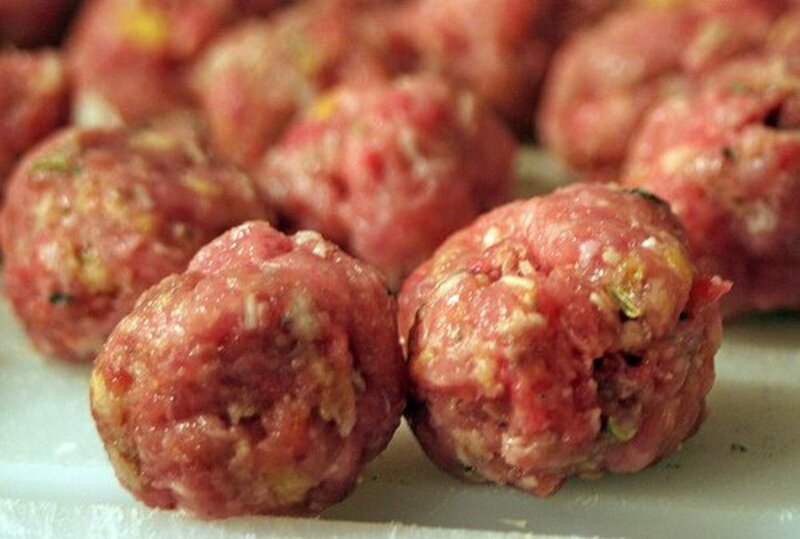 You might also like to add some meats, like crumbled bacon, cooked diced chicken, boiled shrimp, cooked sausage slices, or diced ham. Chopped boiled eggs also make a nice addition, as do grated or shredded cheeses. 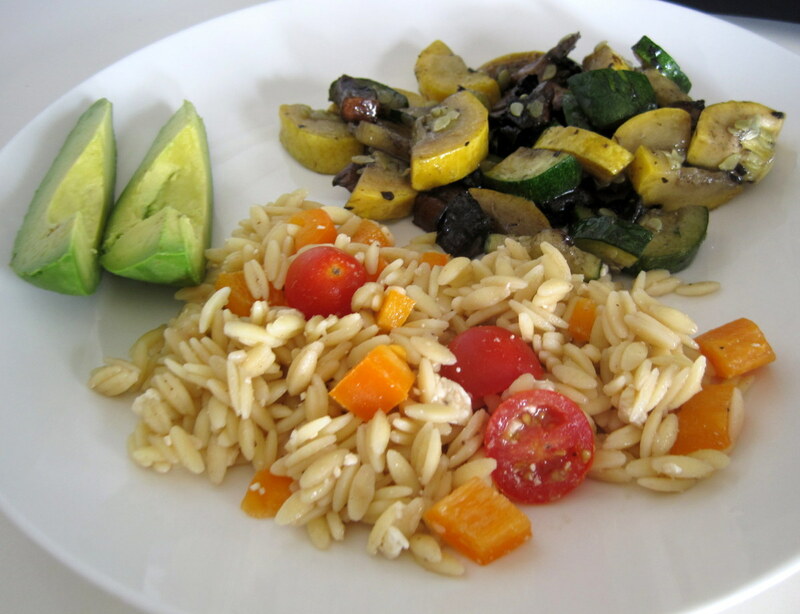 This is a really tasty Italian pasta salad! It’s savory, creamy, and slightly sweet. It’s full of other stuff besides pasta, too. It’s sort of like pizza in a bowl, without the crust, of course. It provides the flavors of tomato, parmesan, bell pepper, onion, black olives, pepperoni, and Italian seasonings – everything I love on my pizzas. This is a great side dish to serve with practically any entrée or main dish, including hamburgers, grilled chicken, baked ham, or hot dogs. Rate my pasta salad recipe! Thanks! Yields: Makes 12 - 15 servings. Cook pasta until done but still firm, al dente. Drain in colander and rinse with cold water. Shake colander to remove more water. You’ll want your pasta to be as “waterless” as possible. Water will dilute the dressing and make it too thin. 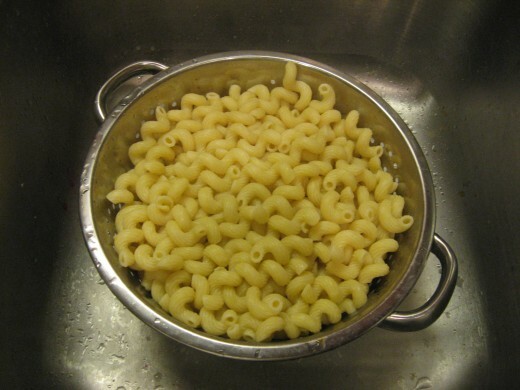 Place pasta in large bowl and cover tightly. Leave in refrigerator until chilled. Cut pepperoni slices into small pieces with kitchen shears. Add to pasta, along with tomato halves, bell pepper, chopped onion, and black olives. Stir to combine. In a separate bowl, whisk together remaining ingredients until dressing is smooth. Pour over pasta and toss well to coat. Cover and leave in refrigerator until thoroughly chilled. Serve cold. 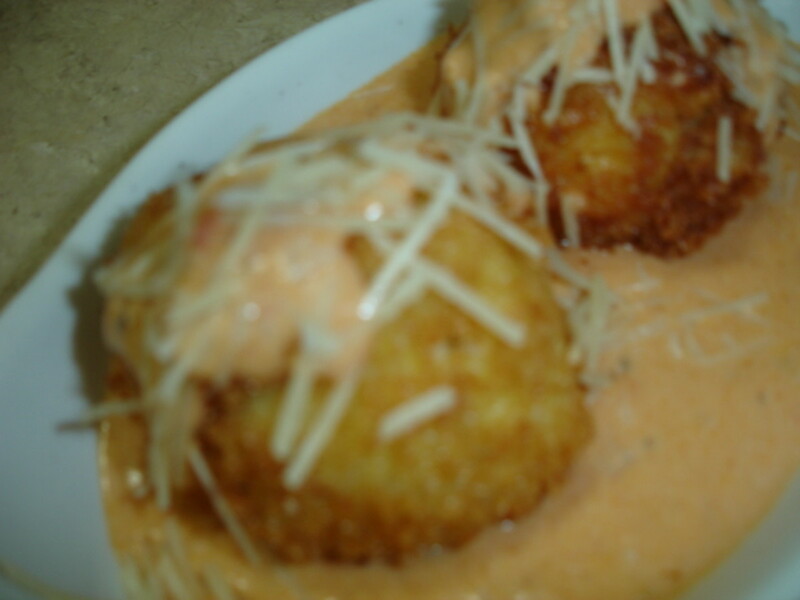 Thank you sharing for the recipe and your creativity. Your photos make me hungry. I made a salad very similar to your recipe for the game last Sunday. What a great idea for a side dish - I'm a pasta lover from the get-go. Thanks for this special edition, Holle. Been missing you, y'know. Lately I can't get enough of homemade Italian dressings, and I'm always on the lookout for new salad recipes. Your salads are so colorful! Thanks for another amazing recipe resource. I love Italian food and I love pasta. Wonderful and delicious recipe! Fast, easy to make and well pasta salads are simply great! I love them, too. 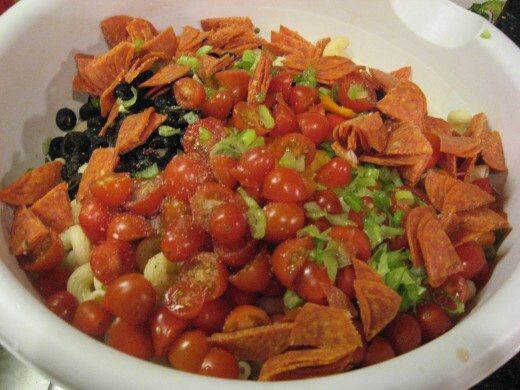 Pasta salads are great for potlucks! I love the Italian version best. I wrote a hub some time ago about some different versions. Not to make you read it or anything, but it's up in the "Discover More Hubs." LOL. I just noticed it. I like the sound of your recipe with all the different spices. I love a good pasta salad and you always have the best recipes. Thanks.